I blew up a scan I had on my old hard drive... she was originally like 800x600, so I cleaned up the pixels on that. @_@; No idea who she is, who drew her, or where she is from if it's an anime/game. Look! No stars! ><; I finally did something without glitter and/or stars! Edit:: Yep, it's from AIR.^^ I confirmed it with a friend. Edit 2:: I fixed this like a day after first making the wall, but forgot to update here... lol. version II uploaded, it just has some color changes and fixed clouds. Tres tres joli wall !!!! Awwwww......Psh like stars or glitter are bad? Bah I say go with what you wanna go with. If others don't like it, too bad. Personally I think you work is far too good to get nit picky about things like that, BUT thats just me. I must say though wow..... That background is simply something else... Makes me wonder about your userpage then....*checks it out*I see......well I'm very glad to see that you had bigger plans for this =D. Blending the buildings and lush angelic-type colors together was a beautiful choice and (what looks to be an arc from what I can see....though I'm probably wrong) the scan is simply amazing....just fine detail and considering you blew it up, still portaining all of the original values...but then again this IS you. So this shouldn't come as a surprize....nonetheless it still amazes me so... Just the overwhelming harmony of everything in this angelic wall just fills me with bliss.....favorite of the day for me..... Simply a masterpiece.. I love it. I really love it. Very excellent wallpaper,I Love background and angel feather. the colors are all soft. ^^. very nice job. i like the way it looks! 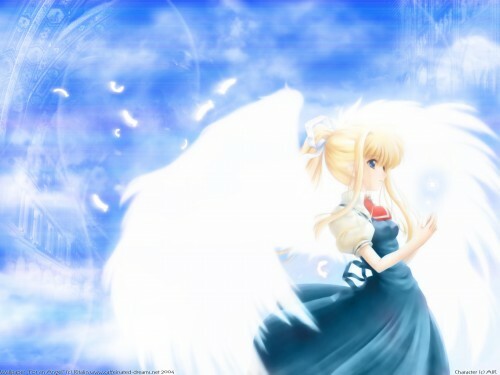 =) it 's really pretty especially the way misuzu looks with the wings and all! good job! w-wow! i really really like this background! yet another one of my favs!! its soo awesome! i reallly reallly like it! and i like the background that blue shade! nicely done! i'm gettin addicted to wings.. =D reallyreallyreally NICE!